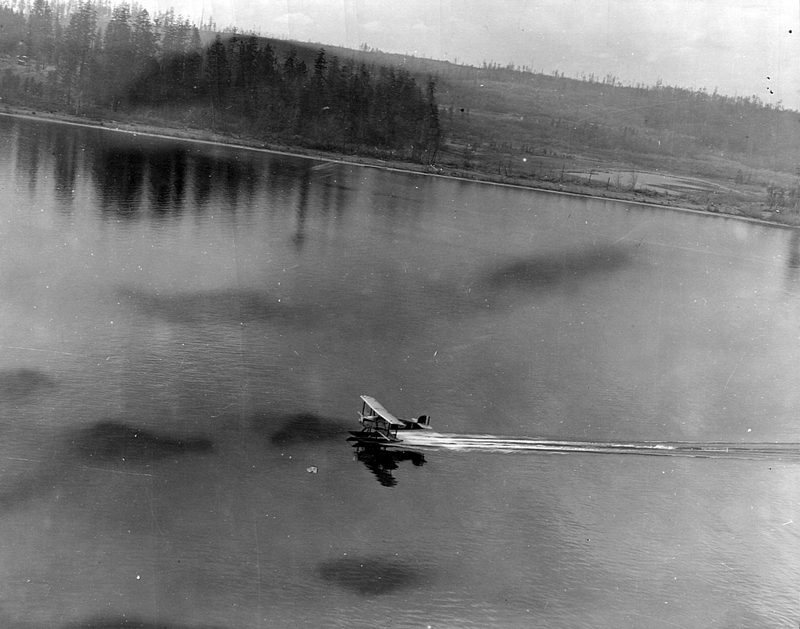 6 April 1924: Four United States Army Air Service Douglas DWC single-engine biplanes departed Sand Point, near Seattle, Washington, on the first aerial circumnavigation of the world. The airplanes were named Boston, Chicago, New Orleans and Seattle. Pilots for the operation had been personally selected by Chief of the Air Service, General Mason Patrick. Pilot of Seattle, (A.S. 23-1229) and in command of the flight, was Major Frederick Leroy Martin. His mechanic was Staff Sergeant Alva L. Harvey. The second airplane, Chicago, (A.S. 23-1230) was piloted by 1st Lieutenant Lowell Herbert Smith, with 1st Lieutenant Leslie P. Arnold. 1st Lieutenant Leigh Wade flew Boston (A.S. 23-1231) with Staff Sergeant Henry Herbert Ogden. The final DWC, New Orleans, (A.S. 23-1232) was flown by 1st Lieutenant Erik Hemming Nelson, with 2nd Lieutenant John Harding, Jr.
Two of the pilots, Martin and Wade, would rise to the rank of major general, and a third, Nelson, to brigadier general. One of the mechanics, Hank Ogden, would become a colonel. Another mechanic, Harding, became a vice president of the Lockheed Aircraft Corporation. The five Douglas World Cruisers, a prototype and four production airplanes, were modified from current production U.S. Navy DT-2 torpedo bombers. 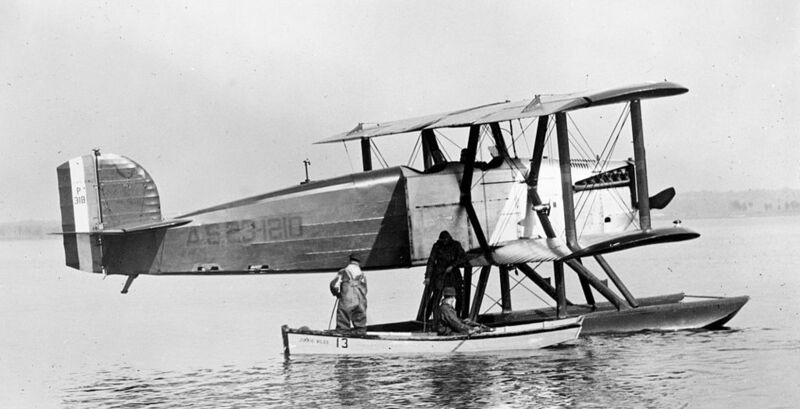 The DWC was a single-engine, two-place, single-bay biplane. The landing gear could be switched from wheels to pontoons for water landings. Fuel capacity was increased to 644 gallons (2,438 liters). The DWC was 35 feet, 9 inches (10.90 meters) long with a wingspan of 50 feet, 6 inches (15.39 meters) and height of 13 feet, 9 inches (4.19 meters). With pontoons installed, the length increased to 39 feet (11.89 meters), and height to 15 feet, 1 inch (15.08 meters). The airplane had an empty weight of 4,380 pounds (1,987 kilograms) with wheels, and 5,180 pounds (2,350 kilograms) with pontoons. The DWC was powered by a water-cooled, normally-aspirated, 1,649.336-cubic-inch-displacement (27.028 liter) Liberty L-12 single overhead cam (SOHC) 45° V-12 engine with a compression ratio of 5.4:1. The Liberty produced 408 horsepower at 1,800 r.p.m. The L-12 as a right-hand tractor, direct-drive engine and it turned turned a two-bladed fixed-pitch wooden propeller. The Liberty 12 was 5 feet, 7.375 inches (1.711 meters) long, 2 feet, 3.0 inches (0.686 meters) wide, and 3 feet, 5.5 inches (1.054 meters) high. It weighed 844 pounds (383 kilograms). The Douglas World Cruiser had a maximum speed of 103 miles per hour (166 kilometers per hour) and ceiling of 10,000 feet (3,048 meters). Its range was 2,000 miles (3,219 kilometers). Seattle was delayed at Sand Point after being damaged during takeoff. Once repaired, Martin and Harvey followed the others, but on 30 April, they crashed in Alaska. The two men were lost in the wilderness for ten days, but only slightly injured. On 2 May, Lieutenant Smith was ordered to assume command of the flight. 175 days later, after flying 27,553 miles (44,342.3 kilometers) in 371 hours, 11 minutes, two of the World Cruisers, Chicago and New Orleans, complete the flight and return to Seattle. Chicago is on display at the Smithsonian National Air and Space Museum and New Orleans is in the collection of the Los Angeles County Natural History Museum. 25 October 1923: First Lieutenant Lowell Herbert Smith and First Lieutenant John P. Richter, Air Service, United States Army, flew a DH-4B from Sumas, Washington, to Tijuana, Mexico, non-stop. The 1,280 mile (2,060 kilometer) flight was made possible by two air-to-air refuelings from tanker airplanes pre-positioned over Eugene, Oregon, and Sacramento, California. The DH-4B tanker over Eugene was flown by First Lieutenants Virgil Hine and Frank W. Siefert. The Sacramento tanker was flown by Captain Robert J. Erwin and First Lieutenant Oliver R. McNeel. 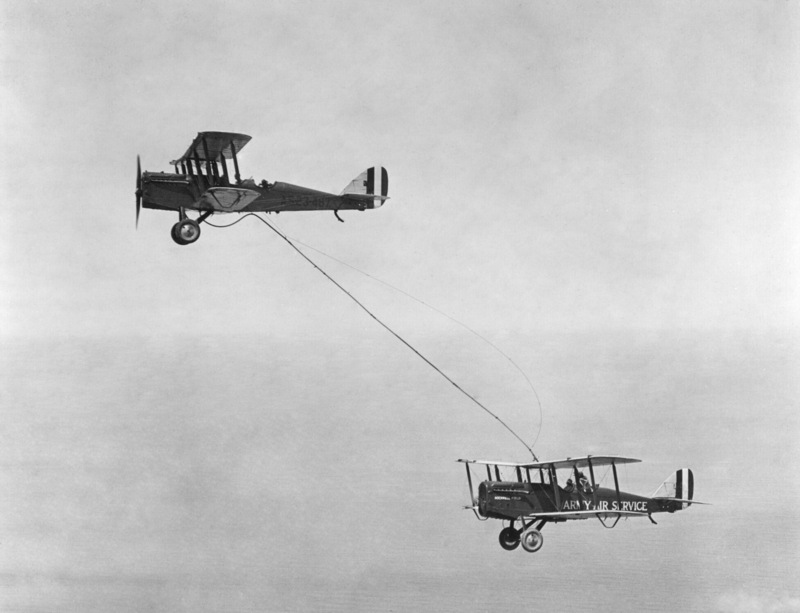 At both locations, Smith and Richter made two refueling contacts before proceeding on their route. On arrival over Mexico, they circled the Tijuana Customs House, then landed at Rockwell Field, San Diego. The flight took approximately 12 hours. Lowell Herbert Smith was born 8 October 1892 in Santa Barbara County, California. He was the second of four children of Jasper Green Smith and Nora Maude Holland Smith. Beginning in 1915, he flew for the Mexican Army. (Another source says that he flew for the revolutionary bandit, Pancho Villa.) Smith graduated from San Fernando College in 1917. He enlisted in the Aviation Section, Signal Corps, United States Army, 8 June 1917, and attended the Military School of Aeronautics at the University of California. Smith was commissioned as a first lieutenant in the Signal Officers Reserve Corps, 13 December 1917. He was promoted to the rank of captain, Aviation Section, 23 October 1918. On 10 September 1920, that commission was vacated and he was commissioned a captain, Air Service. On 18 November 1922, Smith was discharged as captain and appointed first lieutenant. 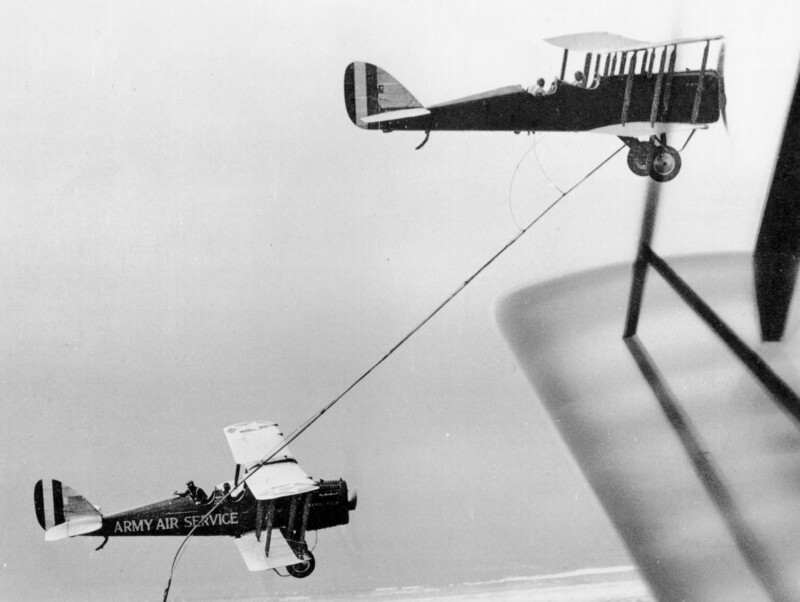 On 27 June 1923, Smith and Richter accomplished the first air refueling over Rockwell Field, San Diego, using air techniques that they also used for the border-to-border flight of 25 October 1926. 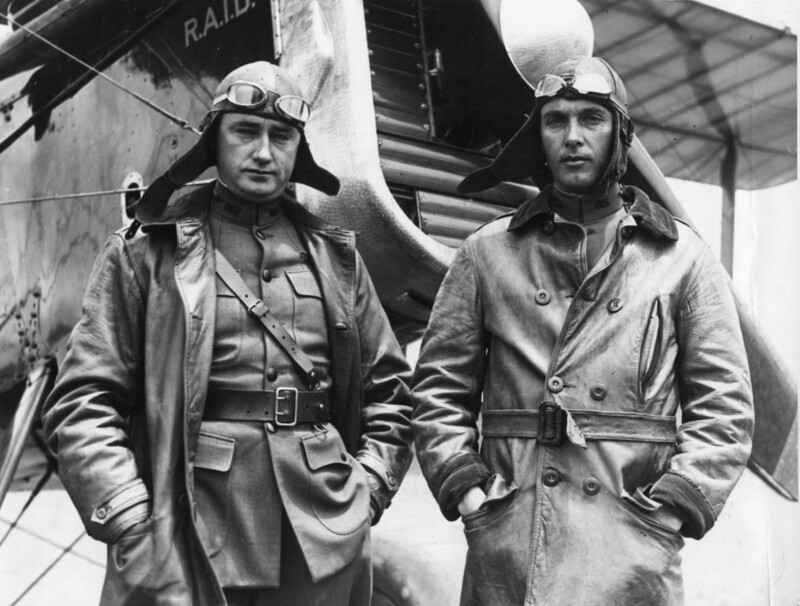 On 28–29 June, Smith and Richter remained airborne over San Diego for 37 hours, 15 minutes, 14½ seconds. For that flight, they were awarded the Distinguished Flying Cross. From 6 April to 28 September 1924, Lowell Smith was the pilot of Airplane No. 2, the Douglas World Cruiser Chicago, on the first circumnavigation by airplane. After Major Frederick Martin crashed his DWC in Alaska, Smith assumed command of the remaining three aircraft for the rest of the 23,942 nautical mile (44,341 kilometers) flight. For this flight, Smith was awarded the Distinguished Service medal. He was again promoted to captain 4 December 1924. Smith graduated from the Army Command and General Staff School in 1935. In 1936 he served on a War Department board that established airplane design standards and procedures for the military to order new aircraft. He was promoted to major on 16 June 1936, and to lieutenant colonel on 1 March 1940. Several months later, with the rapid expansion of the Army Air Corps, on 30 August 1940, he was promoted to lieutenant colonel, and then to colonel, 15 March 1941. During World War II, Colonel Smith commanded Davis-Monthan Army Airfield. Colonel Lowell Herbert Smith, United States Army Air Corps, died as the result of falling from a horse near Tucson, Arizona, 4 November 1945. He was 53 years old. Colonel Smith is buried at the Arlington National Cemetery. John Paul Richter was born in Virginia, 6 January 1991, the first of five children of Otto Frank Richter, a physician, and Nora Kinney Richter. In 1911 he graduated from the Virginia Agricultural and Mechanical College and Polytechnic Institute with a bachelor of science degree in mechanical engineering. He enlisted in the Aviation Section, Signal Enlisted Reserve Corps 22 May 1917, and was commissioned a first lieutenant 20 November 1917. His commission in the Aviation Section was vacated 12 October 1920 and he was appointed a first lieutenant in the Air Service, effective retroactively to 1 July 1920. John Richter married Miss Frances K. Fisher in 1925. Lieutenant Colonel John Paul Richter, United States Army Air Corps, was discharged 31 December 1943. He died 26 April 1964 at the age of 73 years. He is buried at the Gettysburg National Cemetery. The Airco DH.4 was a very successful airplane of World War I, designed by Geoffrey de Havilland. The DH.4 (DH-4 in American service) was a two-place, single-engine, two-bay biplane with fixed landing gear. The fuselage and wings were constructed of wood and covered with doped-fabric. The airplane was produced by several manufacturers in Europe and the United States. The DH-4 was 30 feet, 5 inches (9.271 meters) long with a wingspan of 42 feet, 8 inches (13.005 meters) and height of 10 feet, 6 inches (3.200 meters). The DH-4 had an empty weight of 2,391 pounds, (1,085 kilograms) and gross weight of 4,297 pounds (1,949 kilograms). Fuel capacity was 67 gallons (254 liters). Army Air Service DH-4s were powered by Liberty 12 aircraft engines in place of the Rolls-Royce Eagle VII V-12 of the British-built DH.4 version. The L-12 was water-cooled, normally-aspirated, 1,649.34-cubic-inch-displacement (27.028 liter), single overhead cam (SOHC) 45° V-12 engine. It produced 408 horsepower at 1,800 r.p.m. The L-12 as a right-hand tractor, direct-drive engine and it turned turned a two-bladed fixed-pitch wooden propeller. The Liberty 12 was 67.375 inches (1.711 meters) long, 27.0 inches (0.686 meters) wide, and 41.5 inches (1.054 meters) high. It weighed 844 pounds (383 kilograms). The Liberty 12 aircraft engine was designed by Jesse G. Vincent of the Packard Motor Car Company and Elbert J. Hall of the Hall-Scott Motor Company. This engine was produced by Ford Motor Company, as well as the Buick and Cadillac Divisions of General Motors, The Lincoln Motor Company (which was formed by Henry Leland, the former manager of Cadillac, specifically to manufacture these aircraft engines), Marmon Motor Car Company and the Packard Motor Car Company. Hall-Scott was too small to produce engines in the numbers required. The DH-4 had a maximum speed of 124 miles per hour (200 kilometers per hour), service ceiling of 19,600 feet (5,974 meters) and range of 400 miles (644 kilometers). Many DH-4s were rebuilt as DH-4Bs. These can be identified by the relocated pilot’s cockpit, which was moved aft, closer to the observer’s position. The an enlarged fuel tank was place ahead of the pilot’s cockpit. Following World War II, many were rebuilt with tubular metal frames for the fuselage, replacing the original wooden structure. These aircraft were redesignated DH-4M. 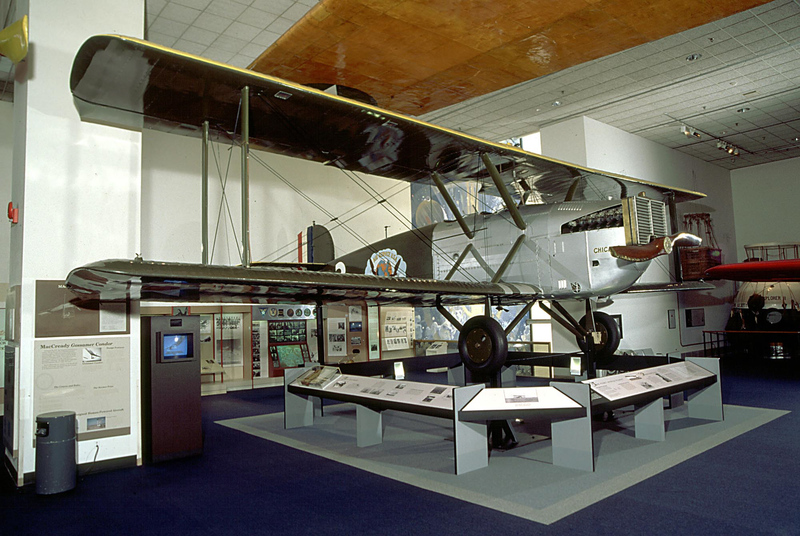 The prototype American DH-4, Dayton-Wright-built airplane, is in the collection of the Smithsonian Institution National Aviation and Space Museum.